Twenty-six-year-old Cameron Wynne is a champion wakeboarder and fan of the electro-funk band Chromeo. His long hair, tanned skin and girlfriend-who-works-in-fashion go a long way toward completing his cool-kid persona. But his beyond-exotic ride provides the finishing touch. Against all expectations—and possibly common sense—the DeLorean is back in limited production, and with it has come a boomlet in DeLoreaniana. Last November Nike’s 6.0 Dunk SE DeLorean sneakers sold out online in minutes. A DMC-12 holds a prime spot in Xbox’s bestselling Gran Turismo videogame. Next month Mattel’s Hot Wheels DeLorean edition will begin its fifth product run in the past year. Not to mention the car’s popularity in the music and film communities. Pop singer Ke$ha drove one to the 2010 MTV Video Music Awards; will.i.am owns one; Kanye West and Die Antwoord are vocal fans. The British band Neon Neon devoted its entire 2008 album, Stainless Style, to DeLorean. At least four movie projects—some backed by DeLorean’s children—are making the rounds in Hollywood. 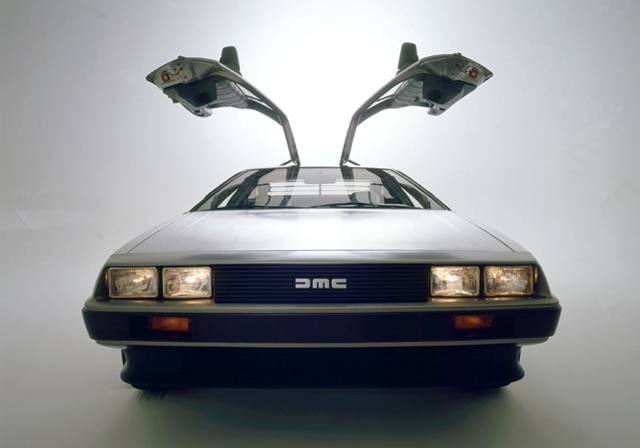 The DeLorean DMC-12 features gullwing doors, unpainted stainless steel body panels, and a rear engine. When John DeLorean launched the original as a challenge to the Corvette in 1981, its 130hp, 2.8-liter V6 went from 0mph to 60mph in 10.5 seconds. It cost $25,000. Since then the car has garnered both favor and contempt. It became notorious in 1982 when DeLorean, desperate to generate cash (a $27 million stock issue had fallen through), became the target of an FBI investigation into drug trafficking. When the Feds caught him on camera in a Los Angeles Sheraton transferring a suitcase filled with 220 pounds of cocaine and famously saying, “It’s as good as gold and just in the nick of time,” their case seemed made. Now, 30 years later, the brand is making a comeback based on its own merits. “People like the car for the car,” emphasizes Stephen Wynne, the 54-year-old CEO of DeLorean Motor Co. Along with son Cameron and 16 employees, Wynne is building and restoring DeLoreans at a 40,000-square-foot facility in Humble, Tex., 30 miles north of Houston. A former mechanic with long caramel bangs, a Carolina Herrera shirt and Prada loafers, Wynne grew up in Liverpool obsessed with cars—his parents’ trick to calm him as a toddler was to put him behind the wheel of the family sedan. Wynne moved to California in 1980 and developed an expertise in repairing DeLoreans, since the intricacies of their French-made Peugeot-Renault-Volvo (PRV) engine and Lotus-designed chassis were second nature for someone used to European vehicles. It didn’t hurt that he could “talk the same language” when tracking car parts across Europe—back in the day DeLorean cars were assembled in Northern Ireland, thanks to millions of dollars in development incentives from the British government. While in California Wynne heard that a company called Kapac had DeLorean engineering data and thousands of spare parts lying fallow. In 1997 he bought out Kapac’s stocks for under a million dollars and by 1999 was the proud owner of all DeLorean branding rights and subsidiaries. Today’s DeLorean Motor Co. makes about six “new” cars a year—they have stainless-steel reproduction chassis and a combination of new-old stock (NOS), original equipment manufacturer (OEM) and reproduction parts. DMC also sells about 60 certified used DeLoreans annually. (The bulk of the business comes from service, repairs and restoration—and, increasingly, from licensing agreements.) The $57,500 new builds have a few modern options—like a CD player, GPS and iPod/Bluetooth—but their look is identical to those built in the 1980s. They’re fun to drive, too. A DMC-12 is not going to win many drag races (though it will be challenged to them often), but it is nimble enough and feels smooth cruising at 70mph down the interstate. Speed aside, the steering is slightly stiff (power steering is not available); the clutch, brake and accelerator pedals are narrow and sit closely to one another, which requires some adjustment. Headroom inside is limited, but the car is 6 feet wide with ample legroom (good enough for the 6-foot-4 DeLorean himself). DeLorean positioned his cars as safer and more “ethical” than those produced by GM. But they were panned initially for poor electronics and ill-fitting doors, along with their excessive weight and the tendency of the steel siding to show fingerprints. Stateside quality control and retooling on the doors worked out the kinks in subsequent generations, and the new DeLoreans are built on a lighter chassis and can be wrapped in any color or pattern to protect the steel panels. Wynne says he has enough original parts to build 500 more new-old cars, including a limited-edition Final Run of 50 to commence production this June. So far, so good: Wynne demurs when asked about profit totals but says DMC revenue has grown to six times the totals of the early 1990s, and last year had an 8% increase in net profits over 2009. When the current supply of parts runs out, the thinking goes, DMC will be able to afford to produce brand-new cars as demand warrants. The car certainly attracts its share of true believers. The DeLorean factory lot has become a pilgrimage destination. There’s the Alabama boy who ran away from home and showed up on Wynne’s doorstep, announcing simply: “I’m here.” The Canadian friends who drove two days straight to arrive at the shop, see the cars, then drive straight back. The Houston dentist who has delayed his move to Australia until his car exceeds the age limit requiring conversion to right-side drive. None of this adulation would have surprised DeLorean himself, who built 9,000 DMC-12s before his FBI bust. His biography was 1980s pop-culture lore: A shining star at GM who developed the Pontiac GTO, DeLorean had a flamboyant lifestyle (chest-hair-displaying V-necks, gold chains, a preference for, as he put it, “women who are dramatically less educated than I”) that clashed with Detroit’s conservative culture. DeLorean decamped to create a vehicle that he hoped would herald a new era of American-branded cars, tapping high-profile investors like Johnny Carson and Sammy Davis Jr., and lining up bank loans and partnerships. Though he would eventually beat the drug charges—jurors ruled in 1984 that he had been entrapped—DeLorean faced ongoing fraud lawsuits. He spent years wrangling over delinquent mortgage payments and legal fees. In 2000 he had to sell his 434-acre Bedminster, N.J. estate to what became a Trump National Golf Club. He died in March 2005 at age 80. Wynne calls DeLorean “a visionary” who had “terrible timing.” Indeed, the original DeLorean company could be compared with what Tesla is trying to do today. Both had charismatic leaders (Elon Musk in Tesla’s case), were founded during deep economic recessions, were priced high for the time (Tesla’s Roadster starts at $109,000; $25,000 in 1981 would buy a small house), received government funding, and were built on the back of Lotus engineering. Both presented a radically different concept of what an American-made car should be. But Wynne just smiles when asked whether DMC will launch its own electric model. He lets on that the DMC-12 is well suited to such a configuration. Not to mention the fact that 30 years down the road DeLoreans are still turning heads. CEO Stephen Wynne is careful about licensing his brand. He turned down a “substantial” offer from Grand Theft Auto, for instance, because he didn’t want DeLorean associated with its violent and drug-riddled content. Here are some licensing proposals DMC did agree to. – Nike 6.0 Dunk SE DeLorean. The $90 sneaks started listing for $400 on eBay the day after they sold out online. Nike designers visited DMC during production to re-create DeLorean taillights in the sole of the shoes. The kicks came packaged in a silver box that opened on either side like gull-wing doors. – Mattel Hot Wheels DeLorean edition. The tiny cars sold 400,000 units last year in the fourth quarter alone. A special Back to the Future version is due out this spring. – The Hundreds. The L.A.-based design shop is heavily influenced by southern California’s skateboarding and surf punk culture. 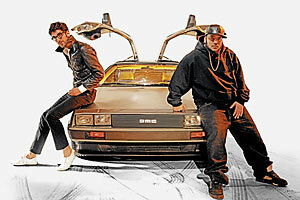 The Hundreds partnered with DMC to produce a special run of DeLorean T-shirts and a wrap option for the DMC-12.